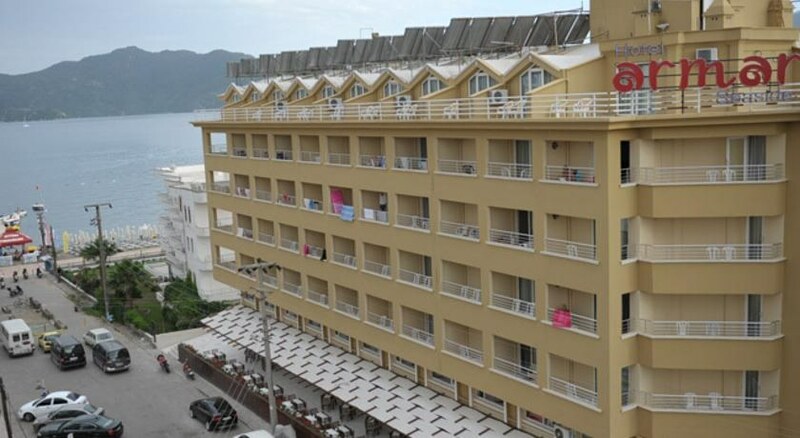 The Armar Seaside Hotel is located in the popular summer resort of Marmaris on the sunny coast of Turkey. Situated only 20 m from the beach and 1 km from the resort centre, this 4 Star hotel is a friendly and affordable base for couples and families who want to be close to the beach and Marmaris resort facilities with a wide range of shops, bars and restaurants nearby. 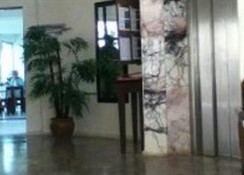 The 80 comfortable standard rooms are all air-conditioned and have side views of the sea. Guests to the Armar Seaside Hotel can discover marvellous beaches, explore delightful villages nearby and experience real Turkish hospitality. Icmeler is 7 km away, and Dalaman Airport is 100 km from the Hotel. Local Tips: Famous for natural beauty, Marmaris has become one of the most popular tourist destinations of the country. Some of its major attractions include Gokova, Marmaris Castle Museum, Selimiye, and Scenic Trail. Food, drink and entertainment: All Inclusive accommodation with an indoor and outdoor restaurant and bar, a la carte beachside and terrace restaurant, pool bar and a poolside snack bar. Standard all inclusive is between 10am and 11pm with breakfast, lunch, dinner, tea and coffee break, snacks, and local drinks. Please note there is no all inclusive concept on the beach. 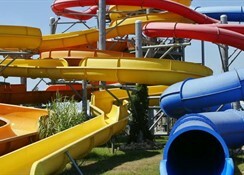 Sports, games and activities: Outdoor pool with children's section, game room (cards, chess, etc. ), table tennis, and darts. Activities with charge include air hockey, table football, computer games, and sea sports available on the beach only. The hotel has a site on the sand and pebble beach that is suitable for children, with complementary sun beds, parasols, and mattresses. Additional: 24 hour reception, lift, air conditioning in public areas, shop/supermarket, laundry (with charge), lobby with Satellite TV, Internet Café (fee), honeymoon added value of free bottle of wine in room and fruit basket. The Armar Seaside Hotel features 80 Standard rooms, which can sleep up to 3 persons, with an additional bed. All rooms have a balcony with side sea view, private bathroom with shower and WC, 24 hour hot water, hair dryer, individual air conditioning and heating, telephone, flat screen Satellite TV, mini bar. A safe box is available for rent payable locally. Free baby cot available on request.